A geek that loves to garden and cook! Can there be too much politeness? We often hear stories about the demise of a polite society as we are rush to achieve our life goals at the expense of others so this post might seem a little out of place but bear with me here. To put it in context I catch a Sydney Ferry to work and for those people that haven’t experienced this delight let me tell you it’s near on THE best way to go to work. The humdrum of work is a distant thought in the morning and forgotten on the way home. Passengers are nice while waiting for the ferry as they orderly line up and allow bicyclist and older people on/off first. There’s polite quiet as people contemplate the view down Sydney Harbour. And they are even nice as they climb aboard the connecting bus. I have seen a number of things that have made me smile such as the ferry ticket collector drumming up support for the school kids to sell their charity chocolates (the kid had completely sold out before even getting to school) and has been echoed by a bus driver. In that case the driver got up before we departed and announced that she loves that route because everyone is so friendly and it makes a great start to her day. So it’s better than the soulless bus or train I hear you say, so what? Stop rubbing it in. But is it possible that too much politeness actually becomes tedious and embarrassing? I’d like to think not but as I disembark in the afternoon almost every single passenger thanks the talented crew member who rarely fails to throw the rope around the bollard. It’s almost as if that single act has ensured that work is left behind and we are now “home”. The crew member politley says “thank you”, “have a nice day”, “see you later” etc and I often wonder that after 200 odd people have left the ferry all the way up the river he’s probably over being polite. I certainly hope not and sincerely hope they get home themselves with a big smile on their face knowing they’ve helped so many people get home! When are egg’s like witches? If you are like my family and end up with ageing egg’s in the fridge then this <probably very well known> trick will help. We end up with ageing egg’s for a number of reasons, not always because we don’t eat them fast enough, sometimes because both my wife and I will have a hankering for eggs and within a day of each other buy a carton or 2. So what do ageing egg’s and witches have in common? In the not-so-distant past people charged with being a witch were thrown into the local river with stones tied around them. For the poor souls that sunk and drowned they were given a proper burial and a big apology. However, witches, apparently because they are made of wood, would float in the river, in which case they were hauled out and burnt at the stake. Rough deal either way in my opinion and a cynic might suggest it was nothing more than a land grab. “Hey I saw my neighbour talking to cat – She’s a witch”, “Good job, either way you can have her land now”. But egg’s? Well, if they if act like a witch and float then they are obviously no good. I’m not suggesting you cook them up on some steak (yeah bad pun I know) but I’d certainly throw them out. They are off and will probably make you sick – more on that in a tick. 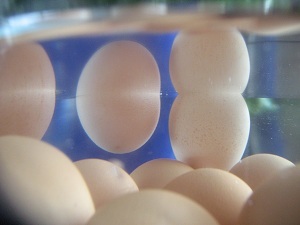 If egg’s sink then they are all good. And rather than give them an apology I’ll fry, boil, poach or otherwise scramble them! Maybe with some thyme or paprika to cleanse their soul. My understanding of why this happens is quite simple. 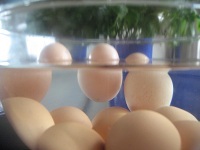 Egg shell’s are permeable, meaning they let air and out albeit quite slowly. An egg that has been in your fridge for too long will have absorbed enough air to both make it float but also send the insides off and should be discarded. The last time I put this test to the test I had my camera and for me it’s the photo’s rather than the story / science / witch-folklore that is interesting. How else can you tell an egg is off? Love to hear any other tricks you use! Since the birth of 2nd child and daughter I’ve been looking for recipies to cook enmasse so I can freeze them up and eat during the week. 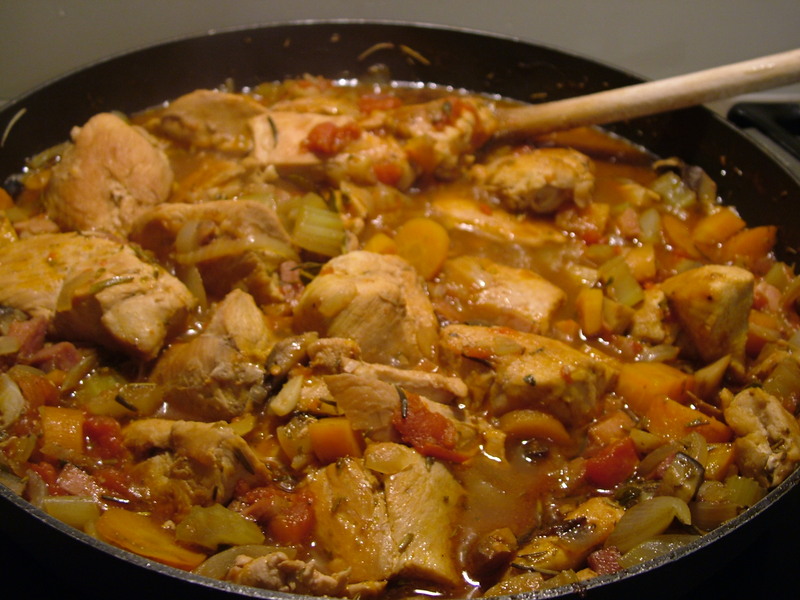 Something that popped up was Chicken Cacciatore. I’m not going to go into a blow by blow of how to cook it (there’s a fair few of those already) but wanted to share an interesting tidbit. Cacciatore means “hunter” in Italian. This is a throw back to the fact that this meal is a hunter’s meal in that they grabbed whatever meat they had (chicken/fowl for instance), threw in any handy vegatables or herbs and cooked it up. Slow cooked if it was a gamey meat and with some wine given they are Italian, my sort of meal. What’s also interesting is that the type of wine used depends on the region of Italy. White in the north and red in the south. For this dish I’ve used a “liberal” dash of red wine, home grown fresh rosemary, home grown fresh bay leaves (yeah I know, a little French) and some dried oregano. Vegetables include carrots, celery, onion and garlic. All served up with some rice….did the Italian’s use rice? How else have you cooked up this Italian stew? Here’s to 2018 – Back to blogging. Feeling guilty shopping the middle isles.